The title says it all. Gonna replace it but wondering if there's something better out there. What would you buy if you were buying a new one? The only things I wish were different about the tello are a higher rez camera and a micro sd slot. Bigger isn't necessarily where I want to go, I like the small size of the Tello. If you want to stick in that size there is nothing that comes close. Once you have flown a Spark beside the Tello you realize how different these two are in terms of size, noise, unwanted attention (and video quality of course ). So if you are happy with what Tello has to offer, just get another one. IMHO, the Spark and Tello are two different drones for two different uses. I own and use them both but very differently. For me, Tello is primarily for indoors. 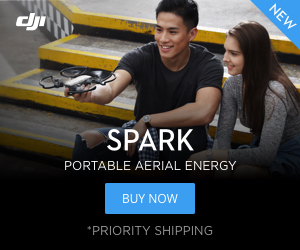 Spark is for action selfies, longer range flights, etc. In the same way I wouldn't comfortably fly my Spark indoors, I don't often fly my Tello outdoors. Without Active Track/Follow Me, the Tello just won't do as a selfie / action camera drone. Without Active Track/Follow Me, the Tello just won't do as a selfie / action camera drone. Seriously I understnad that point. I use Tello for travels and for backyard flights where a "real drone" would upset neighbors. Haaaaa. I tried bringing my Tello on a beach vacation and it was harrowing. You may consider a Yuneek Breeze 4k. I've got one of those also. It's not a DJI, but it is full of features you'd find in a higher end quad. I brought that on a Florida vacation and that work out much better than the Tello. The price swing on the Breeze is nuts. I pad $98 with a controller just before Christmas. I also see them for $150 without a controller so go figure. I do like the Tello aside from the 2 things I mentioned above. I'd love it if they'd put in a micro sd card slot in it and if they'd kick up the camera to at least 1080p. The rest I'm satisfied with. The Breeze is quite a bit bigger, I love the portability of the Tello. I was just wondering if there was a Tello killer out there before I buy a new Tello. If I lost my Tello I’d buy another. There is nothing that comes close. Just get a new Tello. While drones of this size and price point are getting better to get the most out of a better camera you really need a better (more stable) platform. More stable and better able to deal with wind is going to mean bigger with better motors, bigger battery, GPS, etc., etc...more money. That said the Spark is probably the best option if you're talking about the next step in performance/price to provide a better camera and better platform for the camera. ouch, i had a close call with tello once, when i was flying it when sun was going down at beach, wind just picked it up and took it to direction of the sea, i luckily had it pointed toward me at that time, so i immediately lowered it and had no visual or anything, and for full 3 minutes or so, had no picture or anything. was just pushing forward and down on fast mode. i thought it was lost, but eventually came back to range, just pure luck i had it was pointed towards me, when wind took it, also learned that while you dont have picture, you have control of it for a lot longer than you have video. Some times picture cut out but control is fine like you said for whatever reasons. I have that issue from time to time, possibly interference. But one day i was flying with iphone alone, no interference, tello stopped at 100m away and the last image was stuck on screen. This is totally different to the first case where video just goes black. It is always worth trying to push your tello back by flying blind but when your last image get stuck, probably good idea to walk up if possible, chance is tello was out of control range too. Check out the Ninja 913; 200 grams, dual GPS, brushless motors, 1080p, 32 GB SD card, 15 min flight, RC, $150. Or the JJRC H78G 5G WiFi FPV,1080P HD Camera, GPS Dual Mode Positioning, Foldable, 185 grams, 15 min flight, RC and 3 batteries for $105.